We’re going to let you in on a little secret breakfast lovers: we’re rekindling our love affair with waffles. 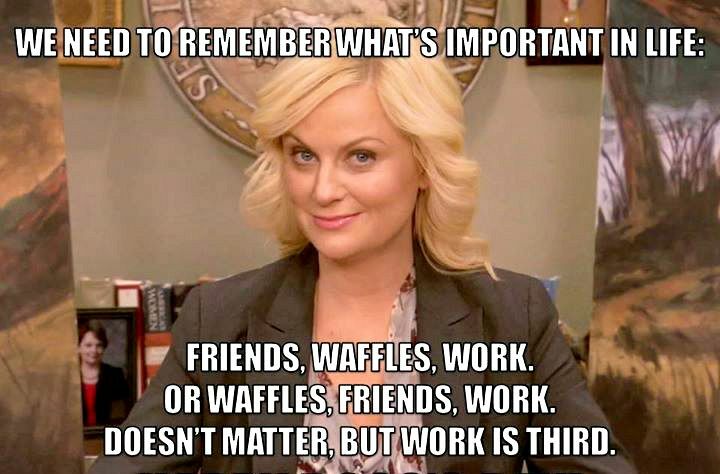 In the words of one Leslie Knope, “We have to remember what’s important in life: friends, waffles, and work.” So, to keep our priorities straight, this weekend, we’re makin’ waffles! Switch it up with the seasons! Sub the apples for strawberries and rhubarb in June or Peaches in August. The world is your waffle. In a medium bowl, whisk together flour, sugar, baking powder, baking soda, and salt; set aside. In a large bowl, whisk together milk, syrup, butter, and eggs; add flour mixture, and mix just until batter is combined. Don't over mix! There should still be lumps. Heat waffle iron according to manufacturer's instructions; brush with oil. Pour batter onto iron (amount depends on iron size), leaving a 1/2-inch border on all sides. Close iron; cook until waffles are golden brown and crisp, 3 to 5 minutes. Transfer to warm oven to keep warm. Meanwhile, slice red prince apple into 1cm slices. Heat skillet until just below smoking. Add butter, brown sugar and apples. Toss to coat and let simmer for 2-3 minutes. Add nuts, toss to coat. Serve atop warm waffles -- and crispy bacon -- with a side of maple syrup!